Blogger is a great platform for bloggers to create blogs for free and express experiences, opinions, and showcase their talents. While Blogger lets you add a poll widget to your Blogger homepage, but it doesn’t include an option to create survey forms, quizzes, etc. Online surveys were first used beginning in 1987 and their popularity and use have increased as internet accessibility and prevalence has increased. 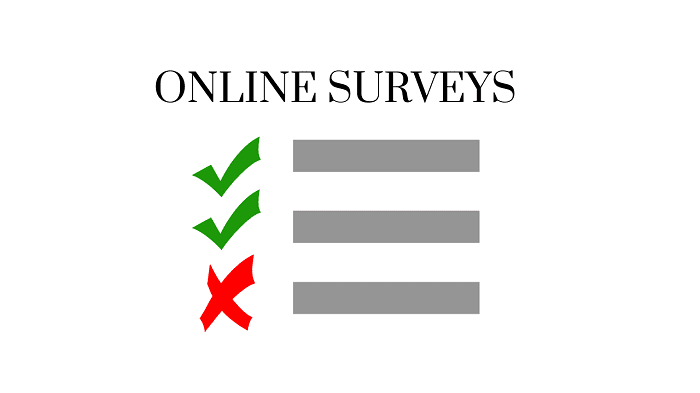 Online surveys have become popular in many areas of research. Many online surveys measures levels of satisfaction with a product, services or you can use it for your blog reviews in order to measure your reader’s satisfaction. And these surveys could help you a lot and can help your business in understanding the market pulses and come up with better products, improve your services, and get better content ideas. If you are really serious and dedicated to blogging then you might have felt at some point, what your readers are really thinking about your blog and the contents that you write for them. Normally, we all use survey forms in order to get feedback from our users or readers and Google Form is a very user-friendly and easy to create online forms and surveys for free. Google Forms is a web-based application developed by Google. It is a free service and a part of the Google Docs suite. 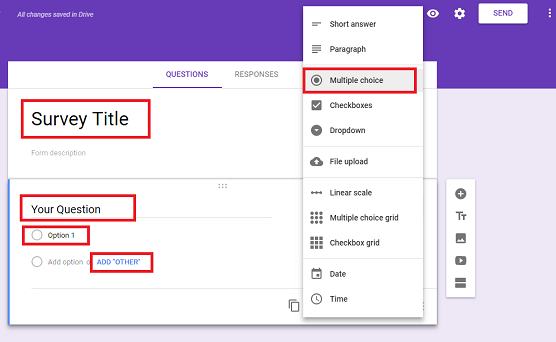 Google Forms allows you to work, create and synchronize with your Google Drive, create forms, surveys, online tests, details for events, etc. and it is one of the easiest ways to collect data online without much of a hassle. 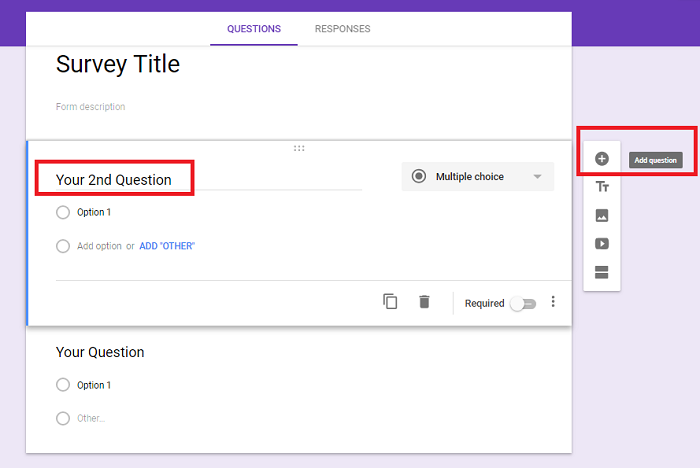 Google Forms provides you with a variety of beautiful, pre-made different themes or create your own, in order to make and look your forms fancy and professional. You can use your own photo or logo and Google Forms will automatically pick just the right colors in order to complete your form. There are many bunches of question options to choose, from multiple choices to drop-downs to a linear scale. You can add images, YouTube videos or you can even get fancy with page branching and question skip logic. You can create a drop-down menu, radio button, checkbox, date picker, etc. You can also add an Excel sheet to the back-end of your form, which will gather all your data in a structured way. 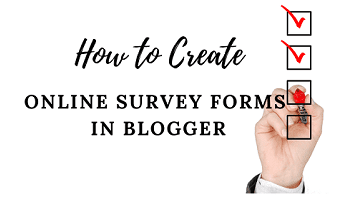 How to Embed Survey Form in Blogger Using Google Forms? 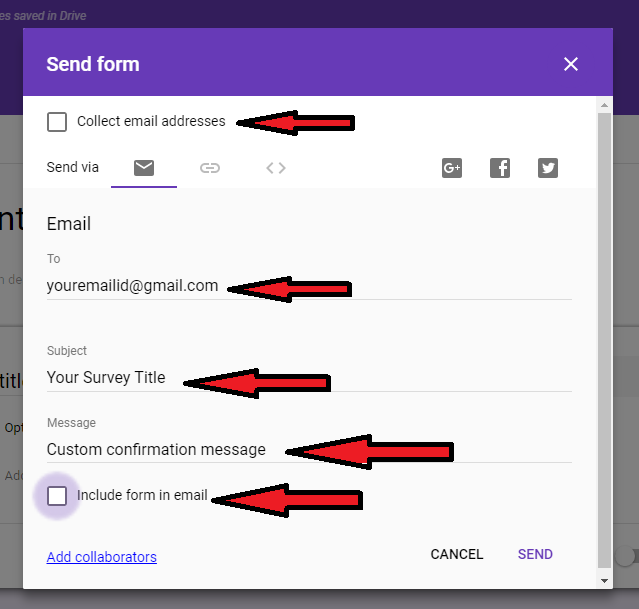 In order to create survey forms in Google, you must have a Google account or Gmail account. And just follow the below simple steps and you will be done within no time. You can always check your survey form in real-time by just clicking of the Eye like icon. (See below screenshot). Go to Google Forms and sign in using your Google mail account. Customizing Google Form is pretty much simple and easy. Write your question in the text where it says Question Title. If you are creating multiple choice questions for your survey form, then you have to provide options on your form. You can add as much as questions or options you want without any restrictions or issues simply clicking on the Plus (+) button on the right side. But don’t make it like an exam with 100 marks and that would annoy the one who is taking the survey. Keep it relevant, what you really need in order to improve your blog or business focusing on user experiences. Once you are done with all the stuff like adding question and options, editing, etc. simply click on the Send button in order to publish your Survey Form. Collect email addresses – When you check this box, your form will also collect the email IDs when your users submit your survey form. Email – Fill with the email address on which you want to receive the successfully submitted survey forms. Subject – Name of your Survey Form. Message – On Message, you can add custom messages, as this message will appear when your visitors successfully completes and submits your survey forms. Include form in email – You can either check the box if you wish to include email addresses in your form. Now click on the < > button in order to get the Embed HTML code. You can also customize and adjust the height and width of your form and copy the code. Step 1. Login to your Blogger blog and create a new Page or Post and switch to HTML editor mode. Step 2. Paste the code that you have copied from the Google Docs and click on Publish button and you are done. So, embedding Google Forms for your online surveys is quite easy and simple. You don't need to have to copy lengthy code snippets or follow other lengthy processes. In fact, Google Docs and almost all Google products are simple and easy to use and most of them are free but has many advanced features. 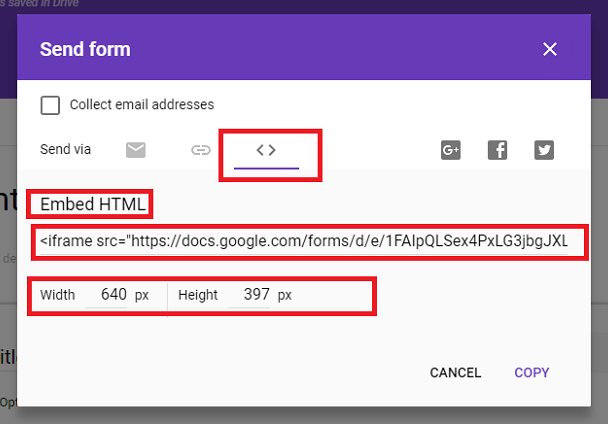 If you take a while and start discovering more feature of Google forms, you can come up creating a beautiful and fascinating form for your blog. If this tutorial has helped you in any way, then kindly do us a favor by sharing this piece on social media sites or leave a comment below. Wrote a post onCustom Robots.txt for Blogger, need your suggestion how im able to depict as per seo friendly article. Got notification from skillinfinity. Followed you there!